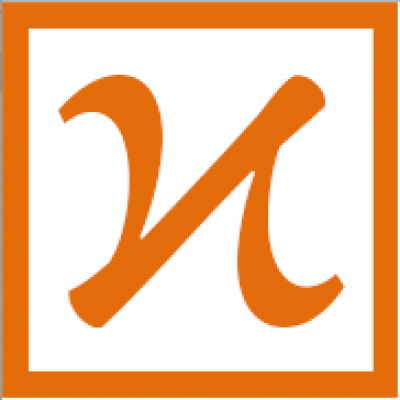 For week 10 of this Fall semester, KTBYTE FUN1a – FUN3b students have participated in the Bebras 2018 Computing Challenge! 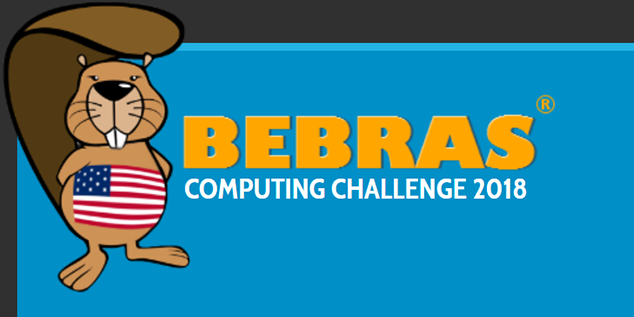 The Bebras Computing Challenge is a yearly online challenge that quizzes students on computational thinking. It has participants that organize for the challenge in over 30 countries across the globe. Because it takes place online, it is accessible to many students, no matter their location. 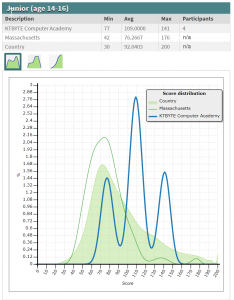 The challenge itself involves the students trying to solve 15 different multiple-choice questions that are meant to test their abilities to think logically. It has many benefits for students and their organizations who decide to participate. This year’s challenge had some interesting results. KTBYTE students in particular did exceptionally well this year! 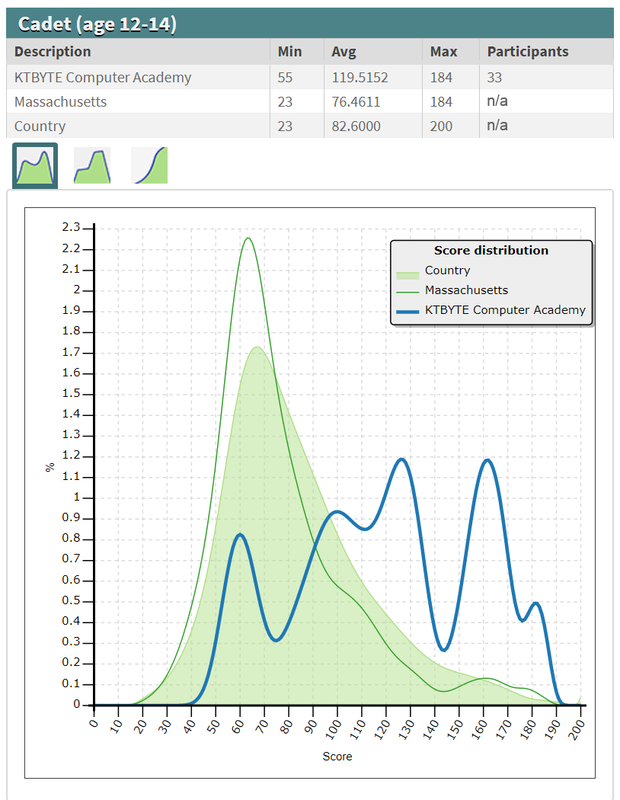 For the Castor group (ages 8-10), KTBYTE students performed better than the average of participants in both Massachusetts as well as the entire country. 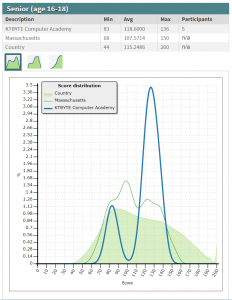 Several students in the Castor group managed to achieve distinctions, and Amanda H. did well enough to be called Best in School for the Castor group. Students who received distinctions include Kevin M., Gavin W., Kerui W., and Benjamin Z. The KTBYTE students in the Benjamin group (ages 10-12) also did incredibly well, having performed better on average than the rest of the country and receiving many distinctions. 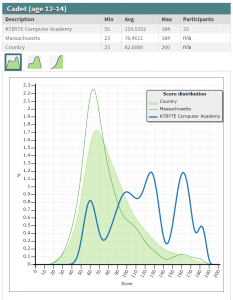 For this group, both Edwin L. and Stephanie W. tied with 184 points to win the Best in School achievement for KTBYTE while Benjamin A., Aaron C., Mirabel H., Christoph H., Flyne L., Luke L., Isaac L., Kevin L., Ben L., Namda N., Ian Q., Riya S., Anna T., Ethan W., Jerry X., Eric Z., Charlie Z., and Crystal Z. received distinctions. 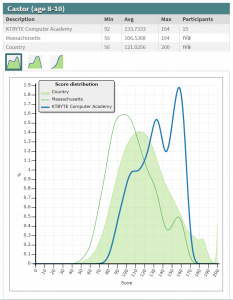 The Cadet group (ages 12-14) saw a similar result as the others in that KTBYTE students had a better average score than the rest of the country. 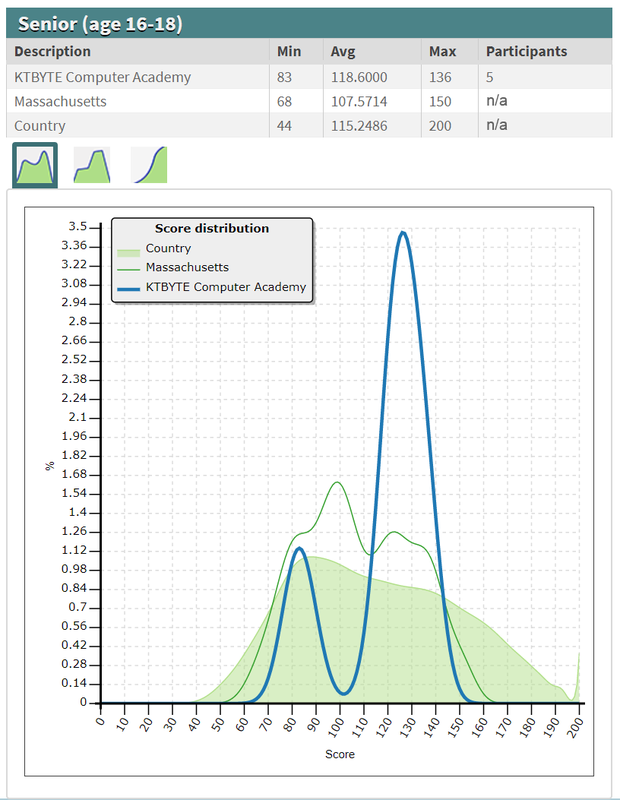 With 184 points, Anthony Y. managed to be Best in School for this group. Meanwhile, Jason G., Jonathan L., Bryan L., Daniel S., Stephanie W., Melinda Y., Eric Z., and Olivia Z. earned distinctions. 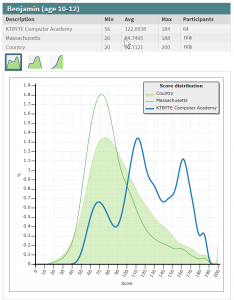 Continuing the trend, KTBYTE students in the Junior group (ages 14-16) also scored higher, on average, than participants in the rest of the country. 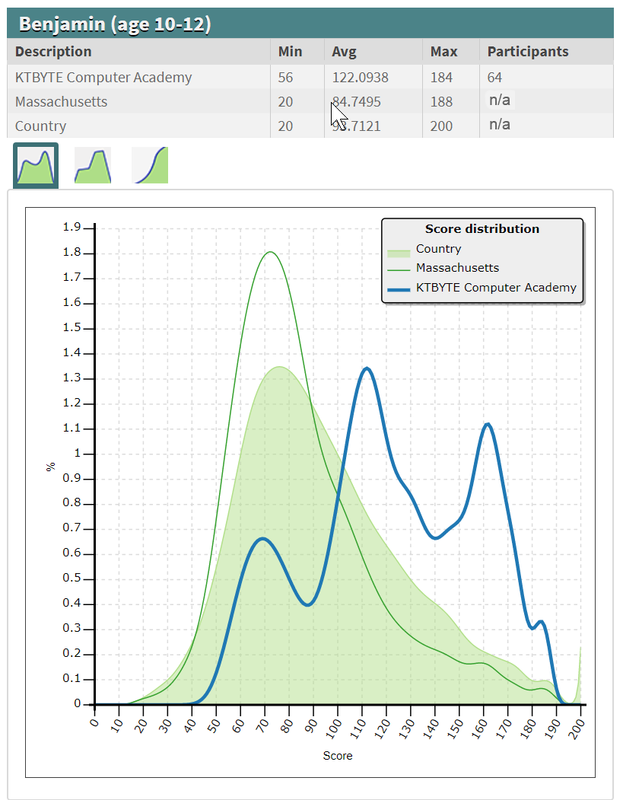 Out of the three KTBYTE students who participated in this group, Q. Bobo was Best in School, having achieved 141 points, and Amanda S. earned a distinction. 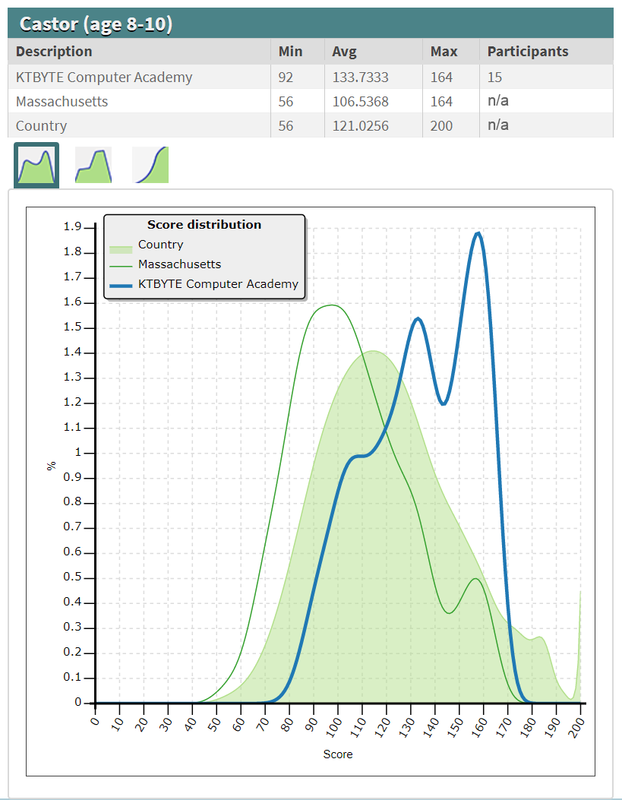 Lastly, while the average scores in the Senior group (ages 16-18) were much closer together than the other groups, KTBYTE students still managed to do better than the rest of the country. Andrew S. won the Best in School achievement for this group and Daniel S. received a distinction. 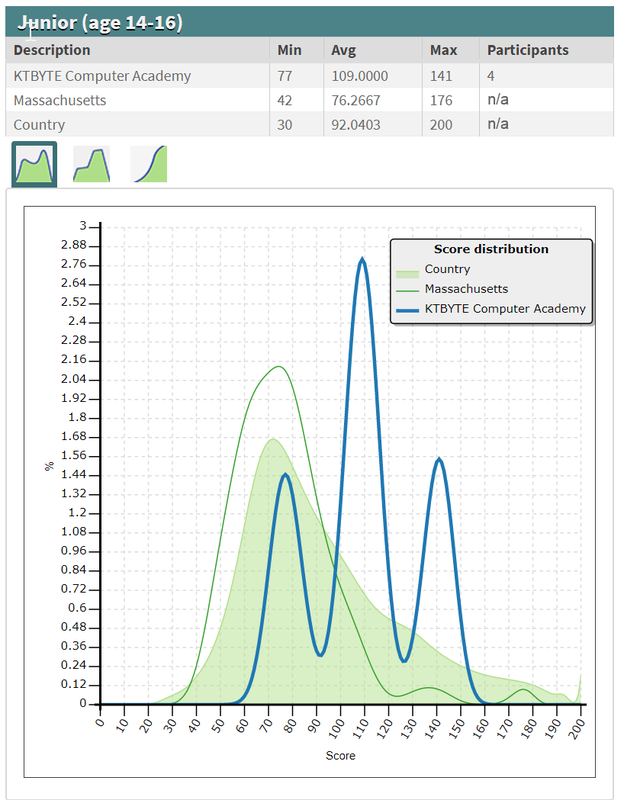 Click here to view how students progress up our computer science course curriculum!